Supplied here are some promotional materials for you to use around your school in the lead up to, and during, Design and Technology Week. Think about creating some of your own specific events and advertising outside of the school! Please send us pics of your school activities so that we can celebrate and share with all of the other DATTA members across Australia! Print out copies of this poster to help promote your activities in school during Design and Technology Week. 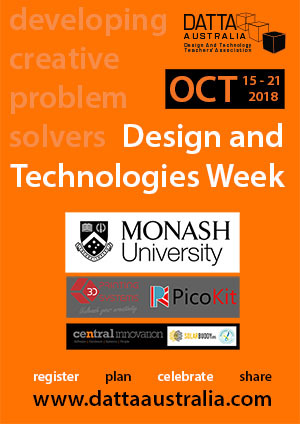 "Design and Technology Week - Welcome to a whole week of celebrating everything Design and Technology! The world needs creative problem solvers and that is what the Design and Technology learning area delivers. Students will have the opportunity to take part in fun and creative activities while exploring the role that design and technology plays in our lives and our futures. More than just making, we encourage everyone to take part and to help us demonstrate just how vital and engaging this learning area is. Look out for new activities in your lessons, lunchtimes and more. Have fun, work safe and be creative!"